As new, more rigorous math standards hit Texas elementary and middle schools this year, school officials are reporting that they lack the resources to help teachers learn the new material. Alison Howell was shocked when she noticed that her third-grade daughter was failing math after just six weeks of class. “I really was thinking, well, this isn’t right. If a child who isn’t having a behavioral problem, and who is listening, and we know is doing her best and successful in other subject areas, she shouldn’t be failing,” said Howell, whose daughter attends school in the Nederland Independent School District in Southeast Texas. Howell soon learned that her daughter was not alone in her struggles. Her daughter’s teacher explained that a new, more rigorous math curriculum was now in Texas elementary and middle schools. Students were now required to learn some concepts as many as two years sooner. 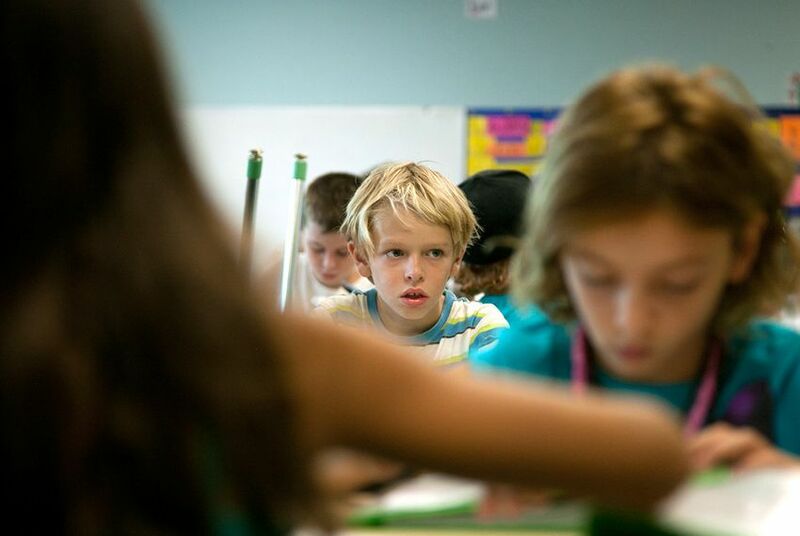 Instead of memorizing multiplication tables in fourth grade, students do it in third. Lessons on fractions previously taught in fourth grade have moved to third grade. Learning to use a protractor to measure and draw an angle now happens in fourth grade instead of sixth. State education officials adopted the revised standards in April 2012 after a regular review of curriculum showed a need to better prepare students for high school and college, said Monica Martinez, an associate commissioner at the Texas Education Agency. Among the new requirements, which were developed over a two-year period, are teaching advanced concepts intended to promote the mathematical reasoning students need for higher education. “There was a feeling that in order for students to be competitive and successful, we really needed to ratchet up the rigor of those standards and ensure we were holding students to at least the level of expectation in other states and other countries,” Martinez said at a November State Board of Education hearing. Three months into the school year, the transition has proved challenging. As parents and educators question whether the rigor of the new curriculum is developmentally appropriate, school officials are reporting that they lack the resources to help teachers learn the new material. Because of the transition to the new curriculum, fifth- and eighth-grade students will not be held back if they fail their state math exams this year, the state education commissioner, Michael Williams, announced in August. But some educators have called for the state to do more to ease concerns in the classroom, including the removal of student performance on math exams from school accountability ratings. “The pace and the concepts are too much. We have children in classrooms who are stressed trying to understand concepts they are not ready for,” Andrea Gonzales, an elementary school principal in Wimberley, said at the November meeting. Other school officials said they had struggled to train teachers in the curriculum before the school year began. “I don’t think anyone ever dreamed that we had teachers at the elementary level or middle school level who can’t teach the higher-level math. Then school districts are having to scramble to find ways to teach the teachers,” said Michael Seabolt, the superintendent of Louise, a small district about 90 minutes south of Houston. He has begun circulating a resolution to school boards, drawing attention to the challenges presented by the new standards. Some larger districts, including Alief in Harris County, were able to better prepare for the transition. Before the state had even adopted the new standards, Alief began changing its curriculum, said Earl Snyder, the district’s elementary school math coordinator. Synder said he supported the new math standards, but that school districts needed more time to put them in place.